Maurice Terzini and Adrian Reed of Motel Mexicola have joined together to open Da Maria Bali. Friends and collaborators over many years in Sydney and Bali, Maurice and Adrian have enjoyed many dinners in Maurice’s Sydney restaurants together and always aimed to bring the Italo Dining concept to Bali. Maurice Terzini is one of the Australia’s most highly regarded creative entrepreneurs, best known for establishing several truly iconic Australian dining venues. Terzini has a gift for dreaming the big picture and executing it, often ahead of his time and breaking ground in ideas, style and locations. It is this standing that he now brings to Da Maria. With spectacular dining destinations in Sydney such as Icebergs Dining Room and Bar (IDRB) and Da Orazio Pizza & Porchetta in Bondi Beach and The Dolphin Hotel in Surry Hills along with influential dining locations such as Caffe e Cucina and Melbourne Wine Room early in his career. Terzini has set a high benchmark for impeccable dining and is now turning his eye to establishing successful dining destinations in Asia. Carl Pickering of Lazzarini Pickering Architects focused on a design very reminiscent of a 1960’s Amalfi Coast courtyard with a cooling, fresh blue and white palette and bold geometric styling. The design pays homage to legendary Italian designer Giò Ponti, who created the iconic Sorrento hotel il Parco dei Principi in 1960 – the first “Design Hotel” – where he designed everything, including the magnificent graphic tiles. 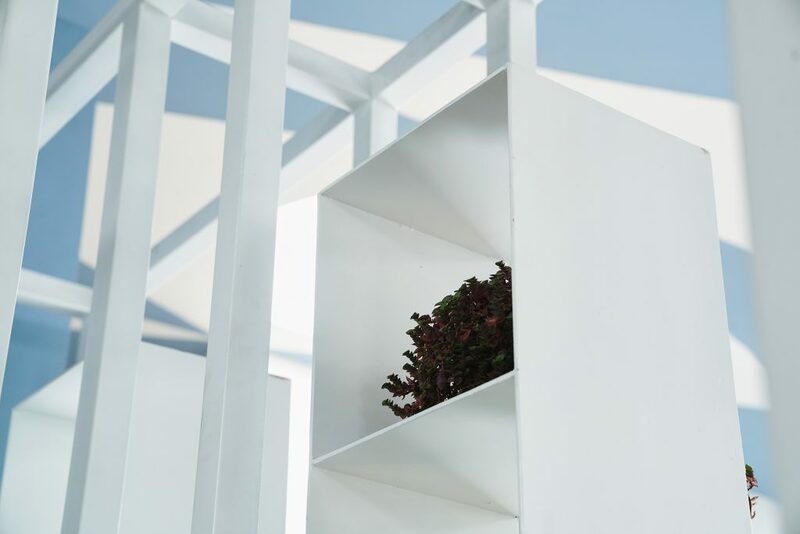 In Da Maria, Pickering wanted to create a cool, fresh space with air conditioning that also felt like a garden. Terzini is about a contemporary reinterpretation of classical Italian hospitality and the design team’s brief was to create for him a restaurant that represented that idea. Inspired by past images, Da Maria looks very third millennium and resembles no other restaurant in the world. The basis behind the design is unpretentious simplicity with the clean European sensibility offset by typically verdant Balinese greenery of rubber trees, cacti and passionfruit vines spiraling down the walls from the Roman Pantheon-inspired skylights that can be either opened or closed. 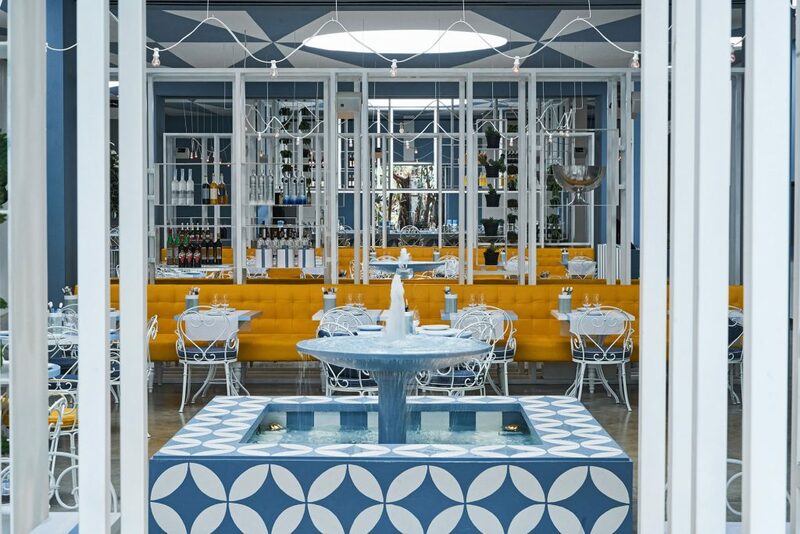 Three fountains are finished with geometric blue and white tiles and sit beneath locally crafted chandeliers that use simple festoon lighting reminiscent of 60’s Italian courtyard restaurants. Bali is full of these lights so Pickering and Terzini wanted to devise something different, deciding on a circular chandelier, in the spirit of the beautiful circular chandeliers they created at IDRB sixteen years ago. The fountain is an Italian and Neapolitan icon but also helps to establish a cool restaurant where the noise of water helps add a refreshing ambiance. There is a very simple fountain in the Santa Chiara cloister in Naples, which came to Pickering and Terzini’s minds when they were designing and with their vision they have recreated the essence of that wonderful part of Italy. Every element of Da Maria was made in Bali and it was very rewarding for Terzini and Pickering to work with extremely talented local craftspeople, always delivering with a smile. The chairs and tables are an expression of the French fer forgé style with modifications made to prototypes and readily delivered, perfect and on time. Pickering’s presence in Bali before the opening was dedicated to fine tuning with a number of elements being ordered at the last minute and, extraordinarily, ready in a day. The ceiling of Da Maria is the most incredible design element, with Pickering referring to it as “Bali’s Sistine Chapel”. 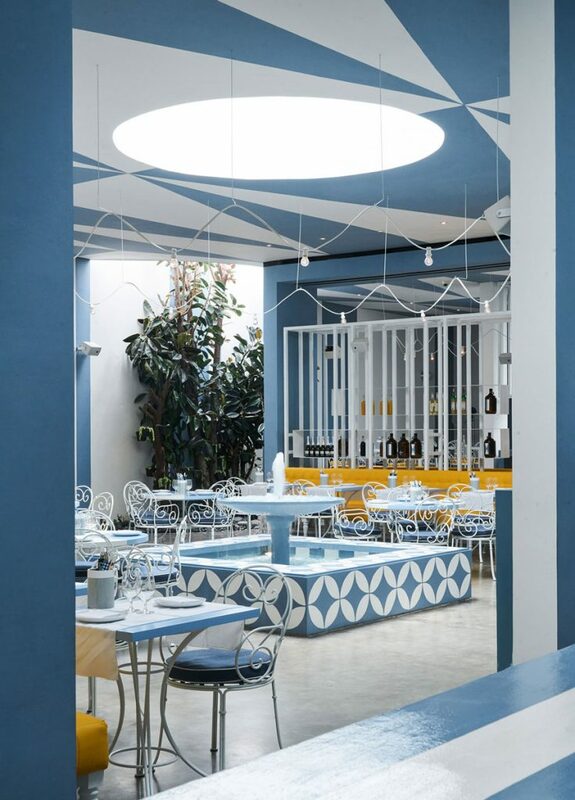 Since the most visible element of the restaurant is the ceiling, the team decided to take some Gio Ponti inspired motifs and enlarge and manipulate them to create the very graphic ceiling that ties in the skylights, the divisions between the rooms and the long, slanted wall along the side. The super-graphic concept was then applied to the other surfaces: where the diagonal Pontiesque lines meet the walls they become stripes. A second graphic was then introduced that resembles the tiles on the bars and fountains. Every aspect has been painstakingly hand-painted by a group of incredible local artists. Terzini and his team have designed a fun and accessible menu that represents a modern approach to simple, classic Italian flavours, with pizza undoubtedly front and centre. 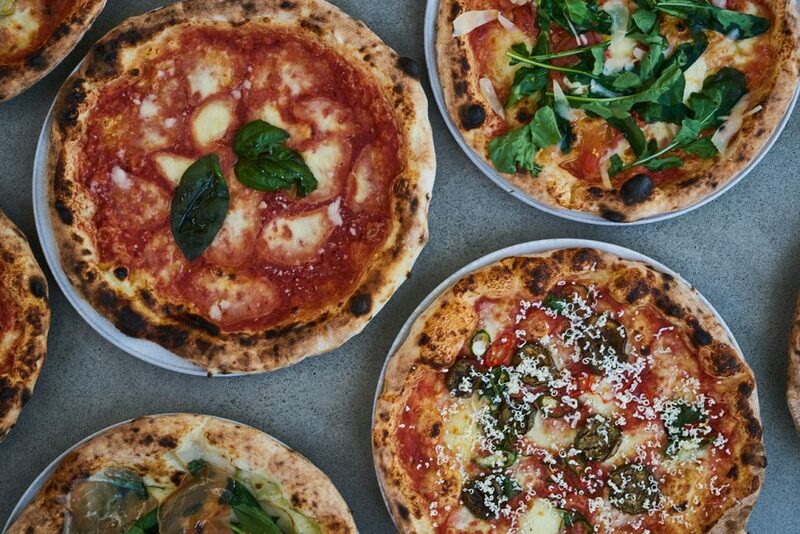 With dough fermented for 24 hours and inspired by special Neapolitan artisan techniques, the pizzas are cooked in local, Naples inspired lava stone ovens. Another spectacular offering is the traditional Italian Porchetta (whole local pig) marinated in local herbs and cooked slowly over coals. Lighter offerings include appetisers such as Asparagus with anchovy butter and parmesan; Snapper Crudo with tomato, chilli and marjoram and Octopus with overnight beans, red wine vinegar and parsley. 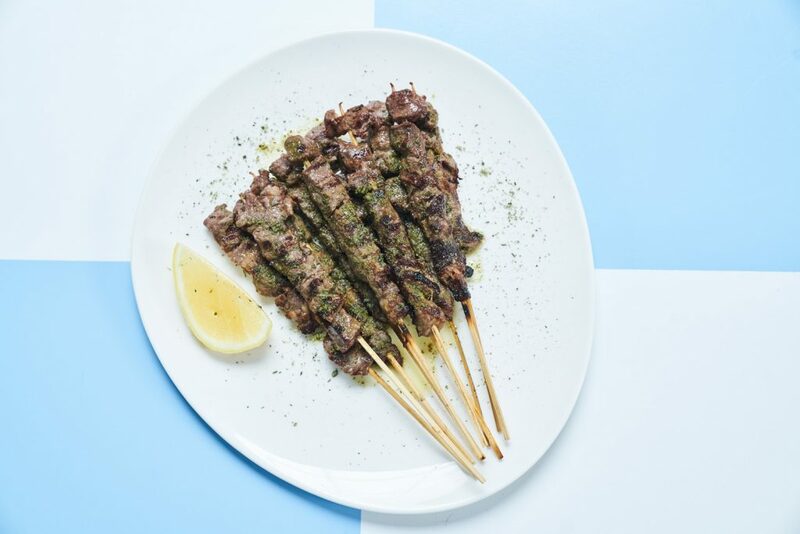 From the wood-fired grill comes King Prawns with chilli, black olives and mint and the Abruzzian Arrosticini – traditional lamb skewers with lemon and rosemary salt in share plates for 5, 10 or 15 guests. There are a variety of fresh pasta dishes such as Oreccheitte with spanner crab, zucchini flowers and lemon or Gnocchi pesto alla Genovese. 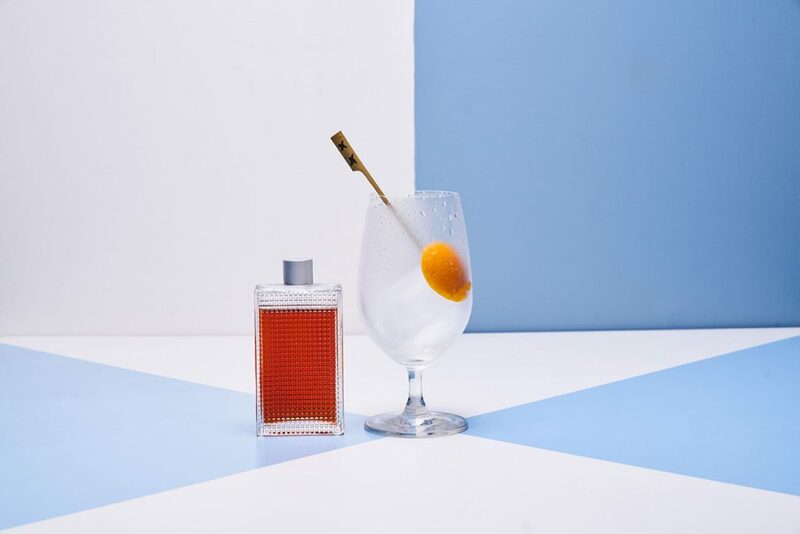 To finish, after a series of desserts such as Bomboloni or the Da Maria Tiramisu, is a house specialty of watermelon served over fresh ice with optional Campari, Lime Sherbert or Chilli Salt. For guests wanting to embark on the Da Maria feasting journey, the La Panarda menu is more of a celebration than a meal and offers groups of diners a selection of dishes to share. Music plays a very important role at Da Maria with the playlist at Da Maria being mixed by iconic Sydney DJ and event producer, Kali from Picnic. Live DJ’s will be introduced every night after 10.30pm, with house music for holiday people being the musical direction. There is a European sophistication to the approach and it is reflective of the notion that every day is a Saturday in Bali and that dinner seamlessly morphs into dancing on the tables. The Da Maria website has links to free playlists reflecting what has been happening in the restaurant and these are regularly updated. This first mix to set the tone is here. Da Maria will collaborate with Adrian Reed from Motel Mexicola to create memorable and unique experiences and events that will feature strongly on the Bali calendar of cool. Terzini has a great history for creating superb events such as his highly sought after New Years Day party at IDRB in Bondi, Sydney. Da Maria has a carefully curated boutique, reflective of Terzini’s background in fashion. His fashion label with partner Lucy Hinkfuss, Ten Pieces, launched in 2011 and has developed a loyal cult following. The boutique, Da Maria Shop by Ten Pieces, is reflective of the culture of Da Maria, with all the uniforms from Ten Pieces and designs reflective of the super graphic nature of the interiors. Ten Pieces is unisex, comfortable, affordable and adaptable, being great for the gym, but also for a night out. Perfect for the Bali lifestyle.